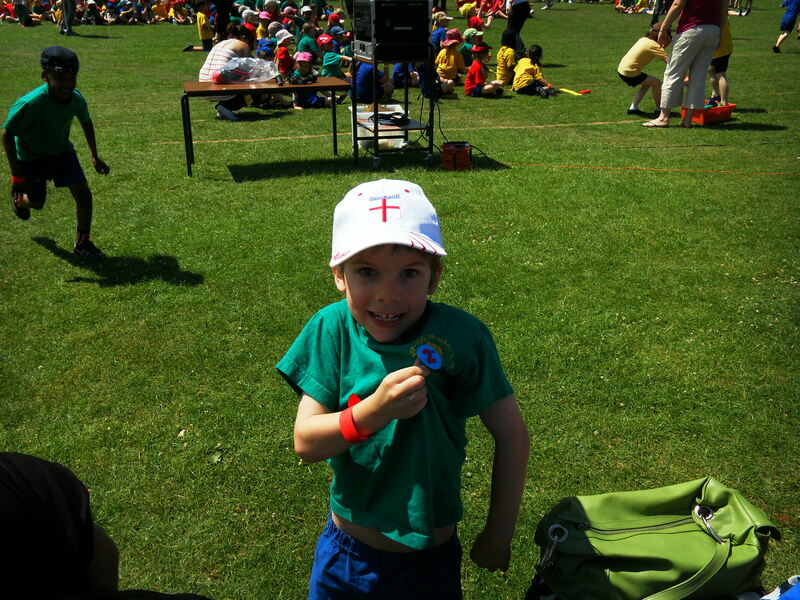 LIMBER-UP fellow parents: It’s sports day fortnight. A time to revel in victories or bemoan the over-competitive. While our nation’s footballers are making us world-class nail-biters, our off-spring will be giving it their all on the playing fields of England. Weather permitting. Primary schools are the last bastion of parental pride for Unusual Sports. But these days you need to be a stay-at-home parent or have a flexible boss to be able to support your kids on school sports day. Having two at the same school means a full-day of me bellowing support from the side-lines. Doug, now in his final year of primary school, Year 6, is doing ‘proper’ events including high jump, long jump, javelin (but not with real ones) and laps of the field. Meanwhile, Billy is in Year 1 (which is actually the second year of primary school) and has progressed from Angelic Angels (are there non-angelic angels?) and Eggs on Toast events to Jumping Jellybeans and Jack and Jill races. I can’t remember the details but there are usually hula hoops, bean bags and balancing involved. And somehow, the teaching assistants manage to keep it all just about together as children have false starts, disappear in all directions and in some cases, refuse to move at all. When the boys were younger, sports days were different. There was a spell when headteachers seemed frightened to let children compete against each other. There were no winners. Everyone got a sticker. It was rather confusing. The kids didn’t know if they were meant to try to win, the parents didn’t know whether to congratulate or commiserate, and although I’m sure the intention was to avoid anyone feeling bad, it didn’t really work. I’m not even sure it sent the right messages about trying your best. A few years on, and schools have re-discovered the benefits of the ‘House’ system, where every pupil is put in a house, like at Hogwarts. At our school they are Cedar, Cherry, Oak and Birch. I can remember mine from primary school: Drake, Raleigh, Grenville and Hawkins. The children are allocated a house when they start school and can win or lose points for behaviour and effort, including at events like sports day. There are some parents who are happily non-competitive. I’d have to hold my hands up and admit I don’t fall in that camp. My children will roll their eyes and tell you of the occasions I’ve taken games a little too seriously. It’s not quite at the stage where the boys worry if they lose, like some poor kids whose ‘Trophy Parents’ seem to be living their own ambitions through their offspring. But I do like to cheer them on, alongside all the other parents who have swapped shifts at work. I draw the line, however, at getting involved in the Parents’ Race. No ta. I may be competitive but I’m not deluded. I’d be the one who fell over, twisted their ankle, or any other manner of public humiliation possible over 50 metres. I won’t further embarrass my kids by trying to hoick my ageing bulk down the field as the other younger, thinner and fitter parents sprint to the finish. That way everyone’s a winner. GOT your childcare sorted for next year then? Yes, it may be time for the long summer break but now’s the time to book your childminder or nursery place for September before school term ends. The first thing you should do is question everyone you know who has children and used childcare. There’s nothing better than a recommendation from another parent. They’ll also be honest enough to tell you what pitfalls to look out for, and who to avoid. If you want a nursery, just drop in to a few and see what’s happening. Most nurseries should welcome ‘surprise’ visitors so you can see exactly what’s going on at any time. There are two types, state-run LEA nurseries, usually attached to a school and often offering part-time places for the over-threes, and year-round private nurseries, who take babies from six weeks up to pre-schoolers of four. Type your postcode into the childcare section of www.direct.gov.uk and you’ll get most registered childcarers in your area, including nurseries.